The rave reviews of 'We Should All Be Feminists' is what introduced me to Adichie, the young Nigerian author. Turns out 'Purple Hibiscus' is her debut novel and is considered one of the most strongest debuts after Arundhati Roy’s 'The God of Small Things'. 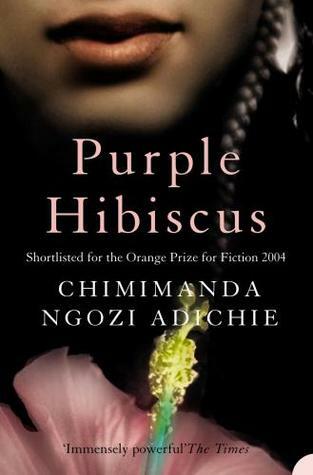 While I have tried and failed reading the latter, 'Purple Hibiscus' made it to my TBR list some time ago. Once I received this book as a birthday gift, it went on to my large pile of unread books. When a lot of people pushed me to read this, I decided to give it a try. I had heard a lot of good reviews about it, but I was not too sure how much I would enjoy an African setting amidst political instability. With zero expectations and ready to abandon if needed, I started reading this book. The book is narrated through the eyes of fifteen year old Kambili Achike who lives with her brother Jaja, her devout Catholic papa, Eugene, and her submissive mama, Beatrice. Papa Eugene is a very powerful man and he runs the only newspaper that dares to speaks against the corrupt government. He is loved and respected by everyone outside his own house. Within the house, he is feared. Papa is a very religious father and he imposes his religion on his family, bordering on the lines of oppression. He subjects them to mental, verbal and frequent physical abuse in the name of religion. Even though Kambili and Jaja are brought up in the lap of luxury, they have no freedom. Their schedules are dictated by their father and they are have set times for every activity. They are trashed if they come second in school, but are showered with gifts and kisses later. While Mama has one miscarriage after another, Kambili and Jaja are facing a battle within their own home. Outside, Nigeria is disintegrating. When Kambili and Jaja visit their father's sister Aunt Ifeoma for a while, they begin to realize what they have been missing. Widowed Aunt Ifeoma is a university professor and mother of her own three adorable children, Amaka, Obiora and Chima. Though poor, they live a life filled with joy, conversations, freedom, individual opinions and laughter. While Amaka doesn't get along with Kambili and secrets envies her lavish lifestyle, Jaja and Obiora get along fabulously. Jaja soon starts opening up and changing as a person. Kambili continues to live in the shadow of her father and shivers in fear every time the phone rings. When a young priest Father Amadi starts visiting them, Kambili slowly starts opening up and living life. She develops a crush on Father Amadi and this brings Amaka and her close. They even get to know their grandfather better and finally Kambili and Jaja learn the importance of love and belief and get the feel of a happy family. Meanwhile, as Mama continues to struggle with Papa, Aunt Ifeoma and family get a chance to leave to America for a better future leaving behind the poverty-inducing corruption, rioting, and uncertainty of basic needs in Nigeria. When Papa's editor, Ade Coker is killed by a bomb at home, everyone fears for Papa Eugene. Will Papa Eugene continue to be so harsh on his family while maintaining a Messiah image outside? Will Kambili and Jaja finally have a peaceful family upbringing? The book answers all these questions and more, in the least expected way. Adichie's writing is simple and honest. Way too honest at times and that held the book on to me like a charm. Unfortunately for me, this book took be back to my childhood. No, I couldn't identify with Kambili as I always was a rebel. Amaka is who struck a chord with me. We weren't very privileged while growing up and we were mocked and looked down upon by our relatives and cousins. Just like Amaka, I had always envied their lifestyle, but as I grew up and looked closer, I was very proud of everything that I had and realized how petty materialistic luxuries are. Apart from this, the story clung on to me and I found myself turning page after page until I reached the last one. While the story has a well set pace, the piercing narration stays with you. The below lines in particular held my attention for a really long time. These lines show the fear that growing minds struggle with. Kambili is an endearing character and I wanted her to stand up and fight for herself. Jaja is a hero in his own way. Aunt Ifeoma can be called the hero of the book too and that's the kind of mother I want to be someday if I ever decide to be one. Mama Beatrice doesn't say much, but brings the whole tale together bravely. I've traveled to Africa before and I could imagine the scenes in my head vividly. There is not a single emotion that this book failed to invoke in me. I'm coming across such an impressive debut novel after a really long time. While I want to give this complete five stars, I deduct one for leaving the story of Aunt Ifeoma and family incomplete. I wanted to know why Aunt Ifeoma and Papa Eugene were so different irrespective of being siblings. I wanted more of Amaka too. Some more lessons, some more smiles for me. Also, maybe Papa Eugene had a reason for being the person that he is. Maybe, he should have had a side story too. Apart from these tiny glitches, I cannot flaw this book. Without an iota of doubt, this book goes on to prove that Adichie is one of the most powerful young voices that we have today. A voice that must be heard often. A voice that cannot be silenced. Verdict: This book is a complete package. No family tale has held my interest for this long. Read this today, you will not be sorry. I've been meaning to pick this up for the longest time and your review has made me want to do it soon! I love Adichie. There's a quiet force about her that I simply adore. She speaks so well. You should listen to her Ted talks. You should read this then. The force is what stands out in her writing. In every word. I've read a few of her Ted talk speeches, need to watch some now. I agree (and understand) what you have said about Aunt Ifeoma and Papa Eugene being so different, but it did not bother me because it happens - there are so many siblings who are strikingly different from each other. I am glad you liked this book. The moment I finished this book, I thought about its sequel. Did you feel so? Siblings are different, yes. But Papa Eugene's deep faith should have come in from some incident in the past or something right? I wanted to know what that was. Yes, I did think of a sequel too. More about what the Achike family would do next once Jaja is out. I want to know. Please do read this one. It is a breezy read, should take a couple of days max. It will teach you so much. I loved this book. Aunt Ifeoma is the real hero of the book. Such an inspiring read. You said it. I loved her character so much, she's an inspiration. Why is that we are sometimes reluctant to pick up good books. I have a pile of unread highly recommended books. I dont know why this unwillingness/hesitancy to read these gems when we are always on a lookout for reading a good book! I have read rave reviews about this book and I am going to pick it up soon. Thanks for the detailed review, Soumya. That's the thing about books, you never know what to expect. Please do read this one, it's totally worth it.